Find your yoga teacher training in New Jersey here! One of the most amazing things about the practice of yoga is that there’s always room for growth. It doesn’t matter if you’ve been practicing for 5 days or 5 years. Sooner or later, you’ll find yourself wanting more. 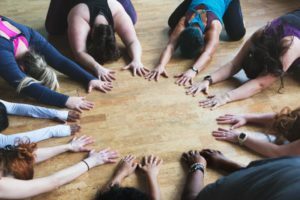 Whether you’re looking for your first 200-house teacher training, an advanced training or a specialized yoga teacher training, there’s a program out there to suit your needs. Check out the list below for some options in New Jersey. Not sure what program is right for you? Learn more about the various Types of Teacher Trainings. Ananta Yoga Studio: 200-Hour Program kicks off in September 2018. Asana Soul Practice: 25-Hour, 50-Hour, and 200-Hour Trainings available. There’s also an apprentice program for 200-Hour Certified teachers. Bhakti Barn Yoga: 200-Hour and 300-Hour Trainings coming up! Flow Yoga Studio: 200-Hour Program starts in September 2018. High Energy Fusion Yoga: 200-Hour Teacher Training begins in January 2019. Hudson Yoga Project: 200-Hour and 300-Hour, and Apprentice Program. Sattva Yoga: Yin Yoga Teacher Training is coming up in October. Shiva Shanti Yoga School: 200-Hour and 300-Hour Trainings, Ayurvedic Health Counselor Certification, and various Specialty Trainings. All Elements Yoga: 200-Hour Program starts in September 2018. Higher Power Yoga: 200-Hour Training starts in February 2019. Hot Yoga Revolution: Specialty Trainings (Yin & Unstoppable Program), in addition to 2019 200-Hour Certification. The American Yoga Academy Studio: 200-Hour Programs begin in September. Anjali Power Yoga: Baptiste Power Vinyasa 200-Hour Training and Mentoring Programs available. Peace Love Yoga Studios: 45-Hour Level One, 200-Hour, and Yin Teacher Trainings. Still Point Yoga Center: 200-Hour Teacher Training starts in September. Yoga & Meditation Center of Haddonfield: 200-Hour Program begins September 2018. Honest Yoga Center: Offers two different 200-Hour Programs, a 300-Hour Training, and Kids/Tween Certifications. Balance Cape May: 200-Hour Program begins November 2018. Blue Moon Yoga: 200-Hour and 300-Hour Teacher Trainings coming this fall. ‘Ohana Rising Yoga School: Upcoming 200-Hour and 300-Hour Programs. The Zen Den Yoga Studio: 200-Hour Intensive Yoga Teacher Training in collaboration with Stone Harbor Yoga kicks off Winter 2019. There are so many more! Did we miss yours? Please let us know.